After hugging a few necks, I've grown accustomed to being greeted with a plate of food when I go down South. And when that happens, there is nothing more perfect than a bunch of black-eyed peas on your plate. Served up with nothing more than a pile of rice or a few tomatoes, it's a crucial piece of my favorite Southern meal. 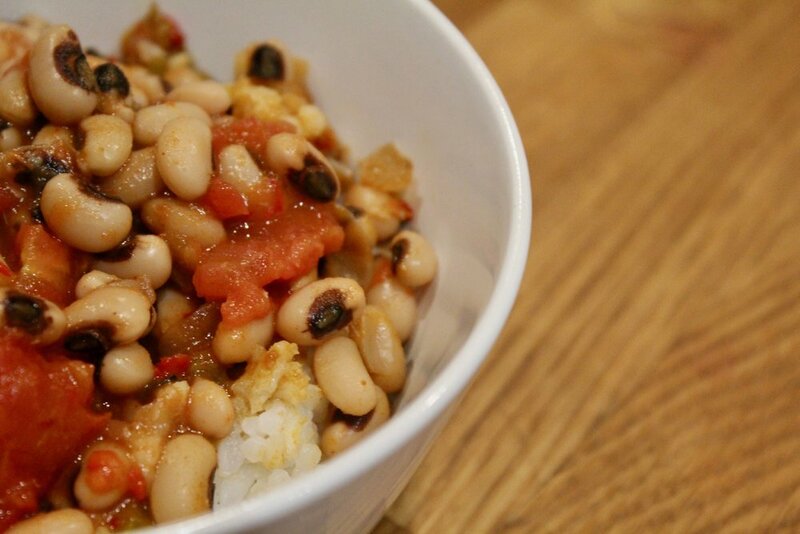 So, I thought I'd try my hand at making Hoppin' John, a classic black-eyed pea recipe that, like many other recipes commonly ascribed to Southern cooks, has its roots in African cuisine. 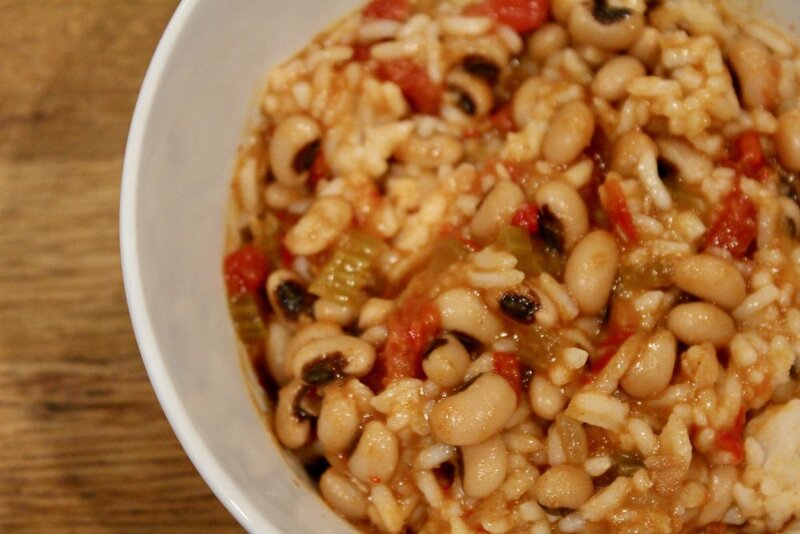 It's a dish with a long history, often associated with celebrations of the New Year. Surprisingly, this isn't a Southern recipe that was served in my family; perhaps because it's more linked to the Carolinas. Just another piece in the complex puzzle that is Southern food. I also gave a little twist to the classic recipe, adding in some Italian heirloom peppers called Jimmy Nardello peppers. 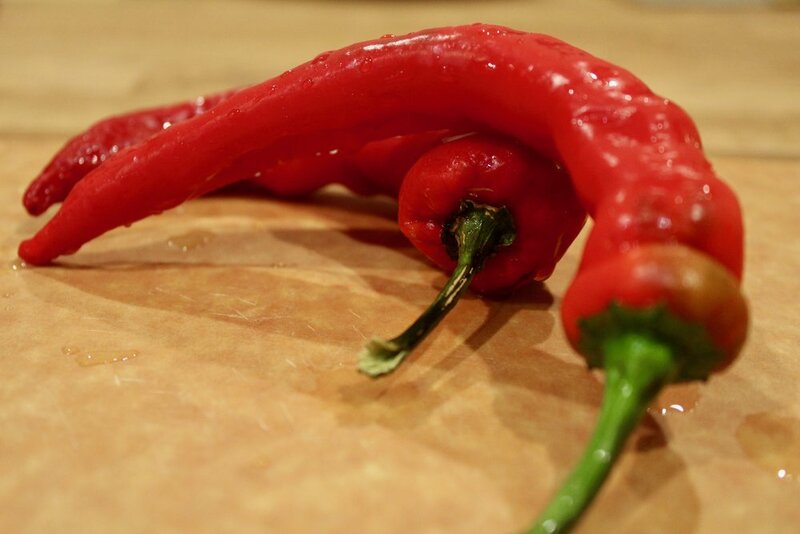 They're a frying pepper that has recently seemed to crop up all over the place; sweet and easy to use in all manner of recipes. They're decidedly un-Southern, arriving in the United States via Connecticut, but I thought that their sweetness would add some nice depth to this otherwise-smoky recipe. It also helps me blend my New England and Southern backgrounds into one dish. Adapted from a Food52 recipe. Soak the peas overnight (or while you're at work) with enough water to cover them by an inch. Drain. Heat olive oil in a large Dutch oven. 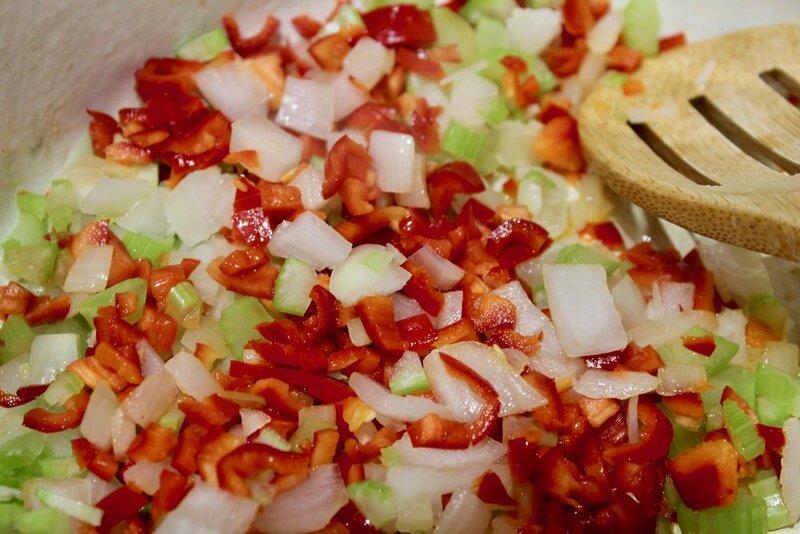 Chop onion, garlic, celery, and peppers into small pieces, adding them into the Dutch oven to fry until the onions are lightly golden. Add the smoked paprika, cumin, and salt to the vegetable mixture. Add the vegetable stock and water to the Dutch oven. Add the black eyed peas to the mixture. Bring to a boil, and then cook at medium heat for 40-50 minutes. Add more water if needed. When the vegetable and bean mixture is cooked through, and the beans are tender, drain the juice from the can of diced tomatoes and add them to the mix. Warm the mixture through, and serve all mixed up with the prepared rice. Don't let its simplicity fool you: This recipe is soul-warming. It is a mix of all the smells and flavors of that first meal you get when you walk through a Southern relative's door. It is proof that the simplest ingredients can elicit the strongest food memories. And that is why I cook Southern.